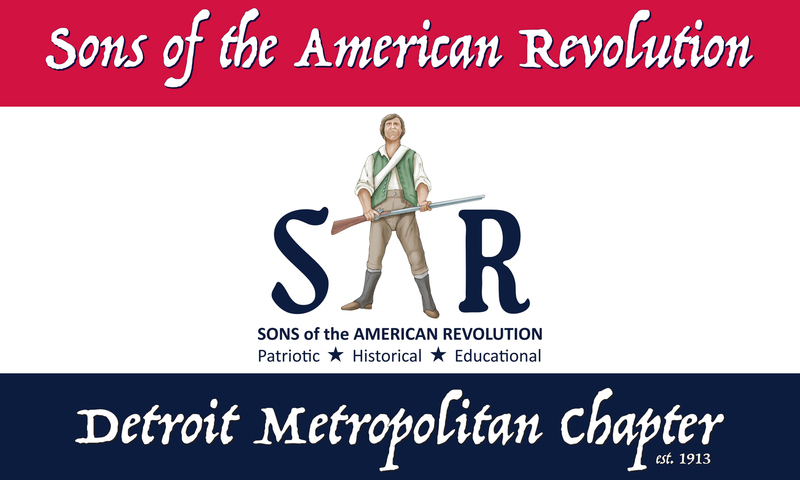 The Detroit Metropolitan Chapter, nominated on March 13, 1913, and chartered on November 1, 1913 at a meeting held in Detroit, has provided patriotic service and support to the Detroit Metro area for over 100 years. 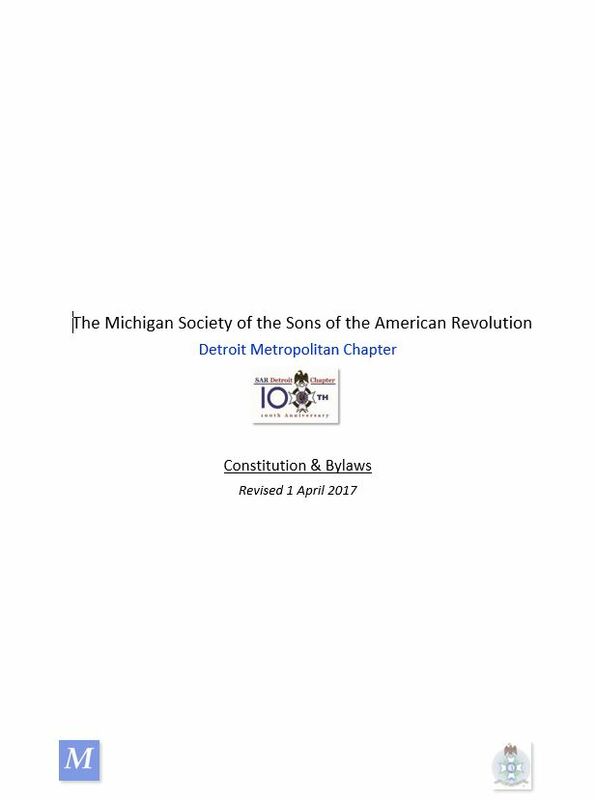 The Detroit area figured prominently in the establishment of the Michigan Society of the SAR, and for many years, state society meetings were held in our city. DMC President Joe Williams has been in the S.A.R for over 40 years. Born and raised in Massachusetts in a working class household, Joe joined the C.A.R. and was active through college. Upon aging out of the C.A.R. in 1976 he joined the S.A.R. He is a: Past President of the Old Colony Chapter (now merged with the Boston Chapter), former member of the Massachusetts S.A.R. Color Guard (marching at both the 200th Anniversary of the Victory at Yorktown, Virginia - the last major battle of the Revolution and the 200th Anniversary of the United States Constitution in Philadelphia, Pennsylvania), as well as a former state officer (2nd Vice President). In 1990, Joe moved to Michigan and became active in the Michigan State Society, serving as President of the Detroit Metropolitan Chapter from 1992 to 1996 and again, 2016 to present. DMC 2nd Vice President Chris White was born and raised in the Detroit area. He served in the United States Army, and has earned a Business degree from Macomb Community College. He has 30 years of experience in the printing and graphics industry, and is currently the operations manager for a local label company. DMC Registrar Gregory Winters has only recently joined the SAR. He comes from a family who had many members serve in WWII, and who subsequently joined a number of patriotic organizations and involved Greg in many of their activities when he was younger, including the VFW, the American Legion, and the the Society of the Forty & Eight. Greg is a graduate of Indiana University and works for General Motors as a technology process analyst. He is a member of a number of genealogical associations, and is a working professional musician. 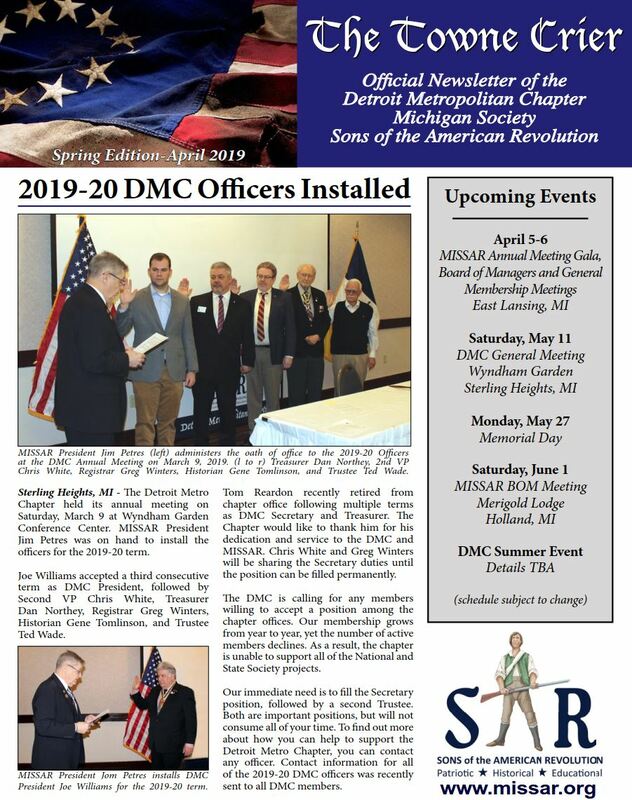 DMC Historian Eugene Tomlinson has been with and has held an officer’s position in the Detroit Metropolitan Chapter for five years. He joined the SAR in Santa Fe, New Mexico, and was President of the Santa Fe Chapter and the New Mexico Society before returning to native Michigan. He holds the Distinguished Service Medal for his work with the New Mexico Society and support to the 122nd Congress of the NSSAR. Born and educated in Dearborn, he has three degrees from Wayne State University and over 55 years of engineering and business experience in aerospace, defense, and automotive industries and was President of Tomlinson Research, a quality and management consulting firm prior to moving to New Mexico and taking oil painting lessons while providing Consulting Services to the Treasury of the State of New Mexico. Gene (now a great-grandfather) and wife Sandy have two sons, and he has two daughters and a son from his first marriage. 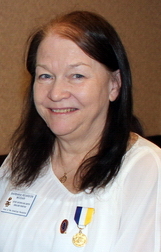 DMC Genealogy Researcher, Barbara Reardon, has lived in Michigan all her life. She holds a Music Education Degree from Eastern Michigan University, but after teaching for four years, changed careers and worked as a logistician in Foreign Military Sales at the US Army Tank-Automotive Command in Warren, Michigan, where she met husband, Tom. She retired in 2008 after 30 years service. Shortly afterwards, she caught the “genealogy bug” when their daughter, Kristine, became interested in joining the DAR and proving the Reardon family story that she was descended from a Patriot who served in the American Revolution. 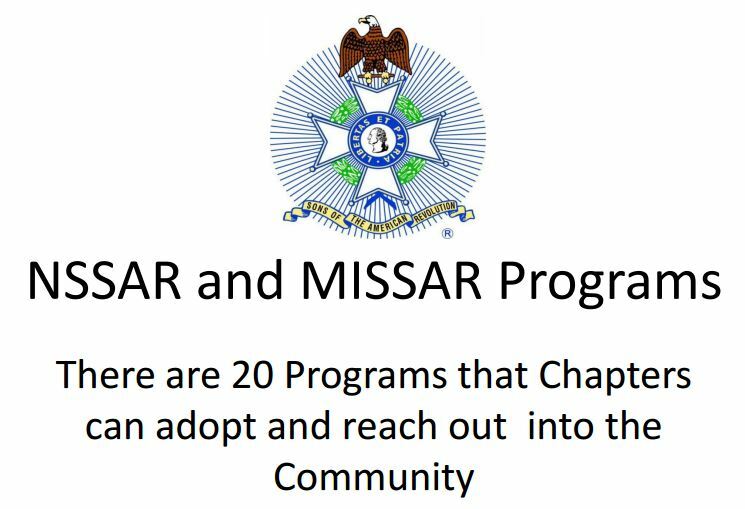 Since then, Barb has assisted nearly 60 new applicants who have been approved for membership in the SAR. Longtime SAR Compatriot and DMC Past President Stuart Shuster passes. View obituary and memorial service information here. DMC Historian Gene Tomlinson shares his memories of Stu here. Included in the Spring 2019 edition of our newsletter (click left) is a summary about our Annual Meeting, "A Year in the Life of a Colonial Farm," and much more! 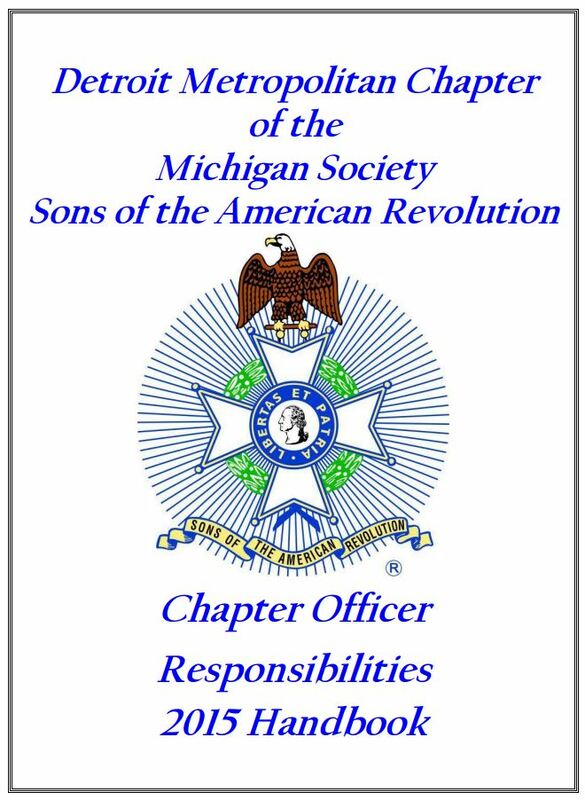 The Detroit Metro Chapter serves all areas of Wayne, Oakland, and Macomb counties. Regular meetings are held the 2nd Saturday of Jan., Mar., May, Sep., and Nov. at the Wyndham Hotel & Conference Center in Sterling Heights.